This is Crocco! 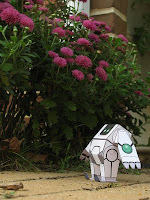 Find him in the latest issue of II Love, the paper model magazine! Marko Zubak (of Ye-Bot fame) does an excellent job in assembling this great mag all on his own. 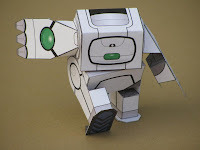 II Love has always been the premiere online magazine for paper model content and still is the ONLY modern paper toy magazine out there! 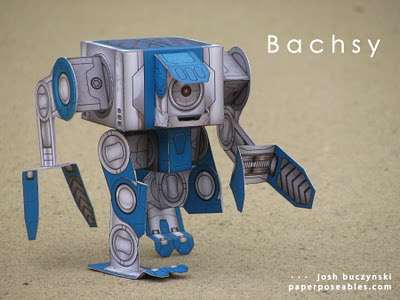 Paper modelers are usually the type of people that just constantly make stuff. Once you make something, it's always a little easier and more fun to design the next thing. You can see this rule play out with Tyler Tinsley's next Kickstarter campaign, right here: Melon the Mouse. 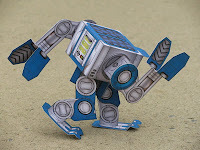 And he's got a new way to move! 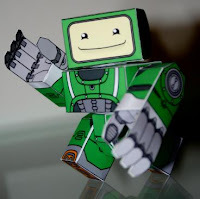 From the indie game, Blocks That Matter by Swing Swing Submarine, now you can build your own pop-N-pose Tetrobot. 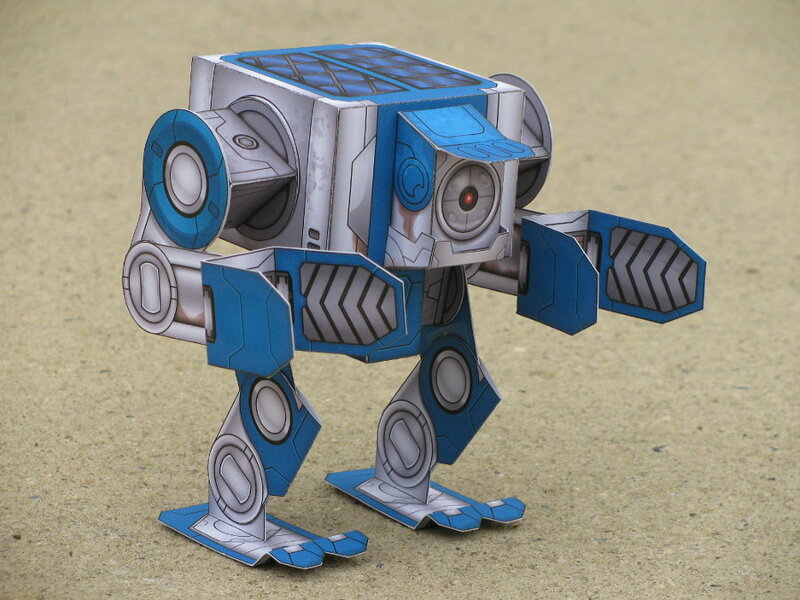 Print this cubic character on thick card stock, glue it up, then find the coolest stance for this little guy! 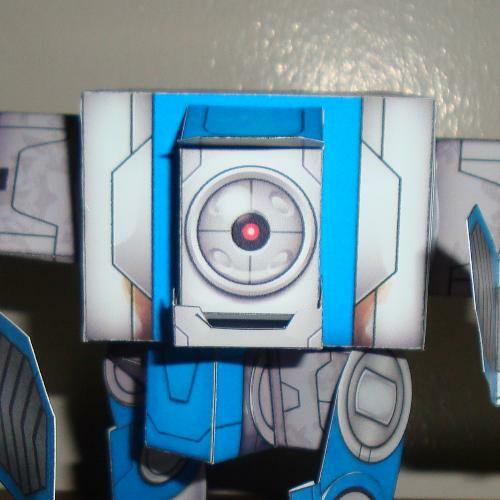 The arms and legs fit into slots on the sides and bottom. 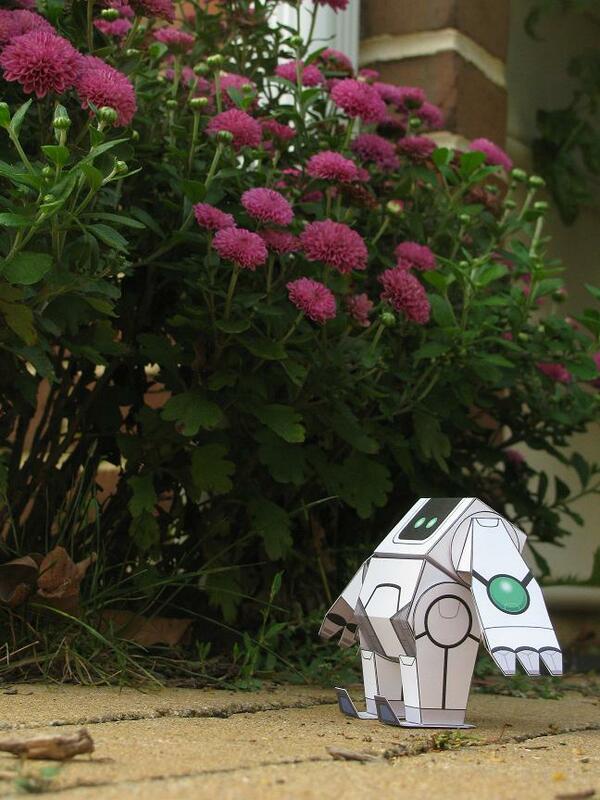 Small pieces of paper inside hold the limbs steady. 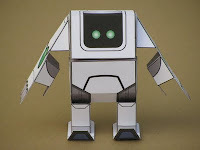 Pop the parts in and out in different ways to make Tetrobot stand, recline, walk, celebrate or even freak out! 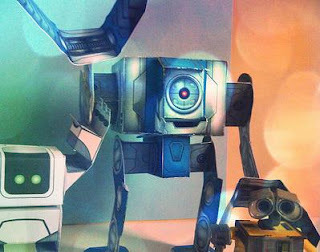 The Humble Indie Bundle has proven many times over that getting Indie games AND donating to useful groups like the EFF and Child's Play works! Pay what you want and get three great games; Voxatron, Blocks that Matter, and The Binding of Isaac. 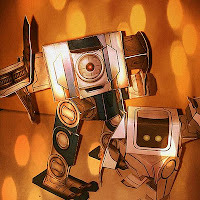 Soundtracks are also downloadable for the latter two games! To help celebrate the Humble Indie Bundle, go ahead and build some free paper toys of characters from these games. Cubeecraft has already released two characters from The Binding of Isaac - Isaac himself (stricken with fear) and the disgusting Monstro, a mini boss that will crush you! 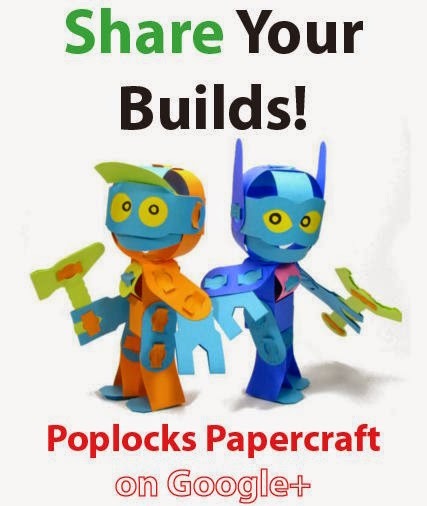 Click on the images to download your own! 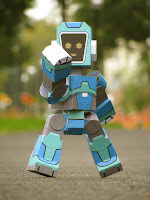 Now you can download and build the main Robot Hero from Voxatron in Cubee form! Also, have a go at making Tetrobot from Blocks That Matter -- pop the parts in and out to make him pose in several different ways! 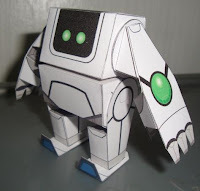 I want to thank everybody who has sent in pics of the robots they've built, so here is a mini gallery of some photos from fellow modelers on Nice Paper Toys to show my thanks! 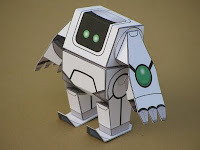 Click on them to visit each user's photo gallery at Nice Paper Toys. See what else they make and like! I made a small "oops" and I apologize. 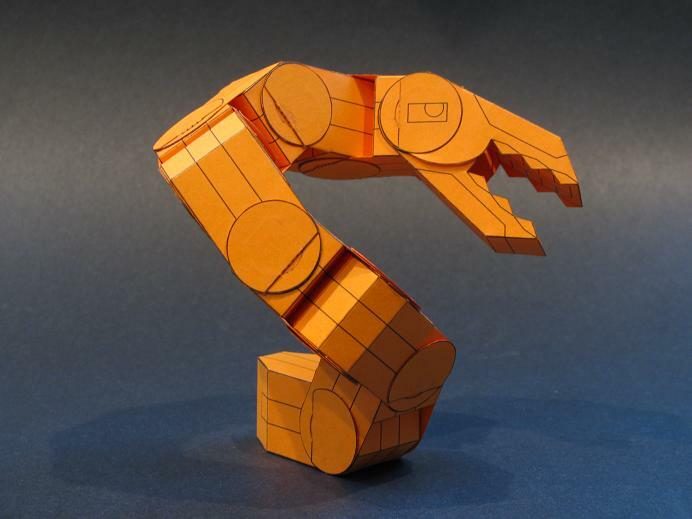 The previous version of the Facebot Dynactron template contained two identical left hand pieces. 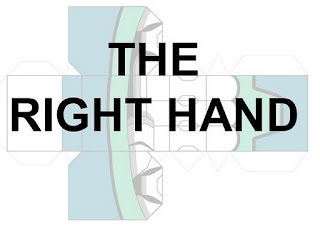 Not too great if you wanted a right and left hand! 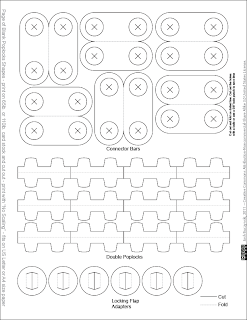 The template has been updated to fix this issue, and I am also including a link to a PDF file which just contains a "Right Hand" part that you can print out. 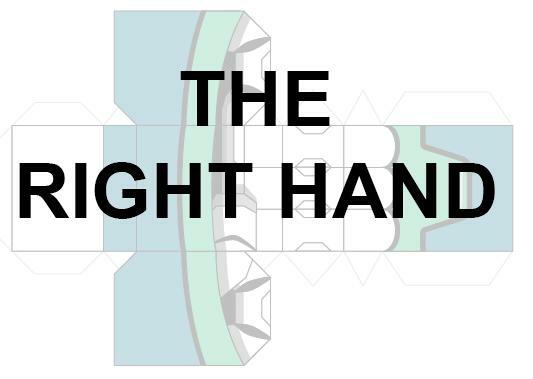 Simply print out and assemble the right hand. 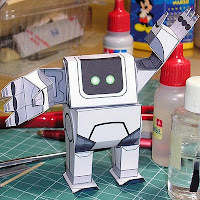 Cut off the right hand on your completed Facebot using scissors or a knife. Glue on the new hand where the old one was! If you cut cleanly enough, nobody will ever know! Thanks to Dan for letting me know about the problem! Are you ready for this one? Bachsy is my third take on an old design from a while back! I went a little bit crazy on the details. 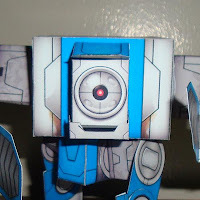 He's box-shaped but he still has a bit of class, even though he's just built to push crates..
Only four pages of parts and full step-by-step photo instructions. 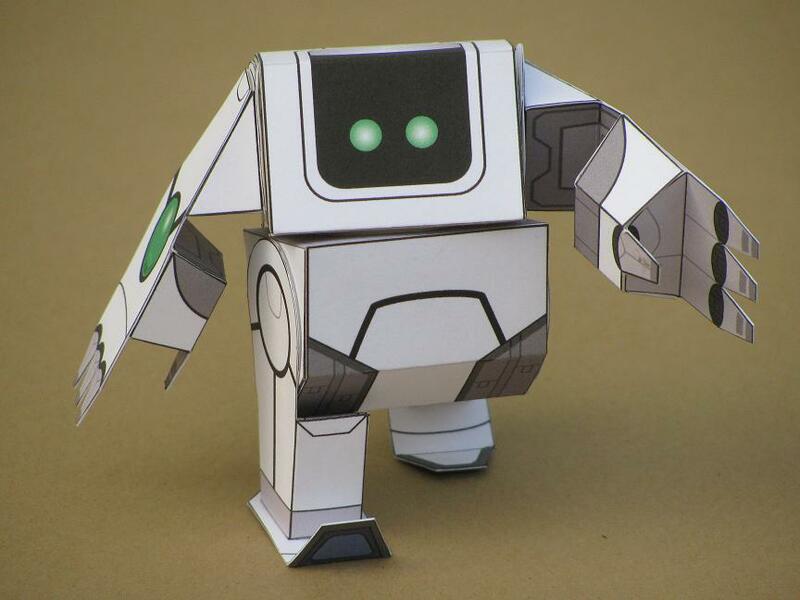 This boxy bot is easy to build if you have a little bit of experience making paper toys. 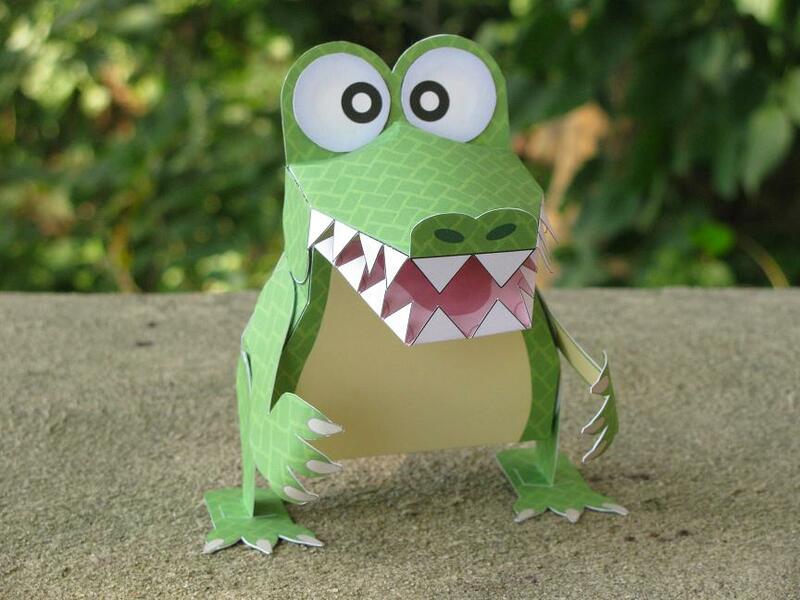 Print on thick 110lb card stock for maximum durability and fun! The patterns fit in the margins for both Letter or A4 paper sizes. 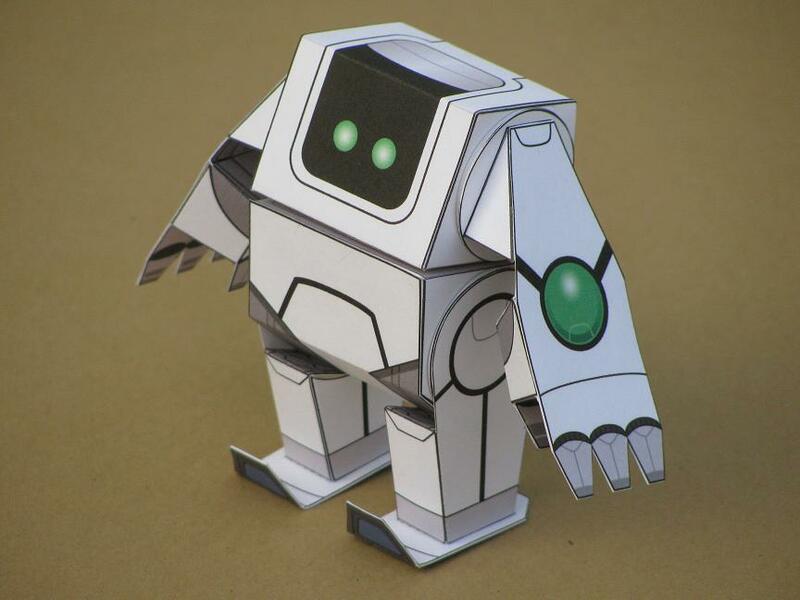 This is a paper toy kit I found while looking for paper toy books online. Urban Robots is published by DJECO, a French toy company that makes children's toys and craft kits. 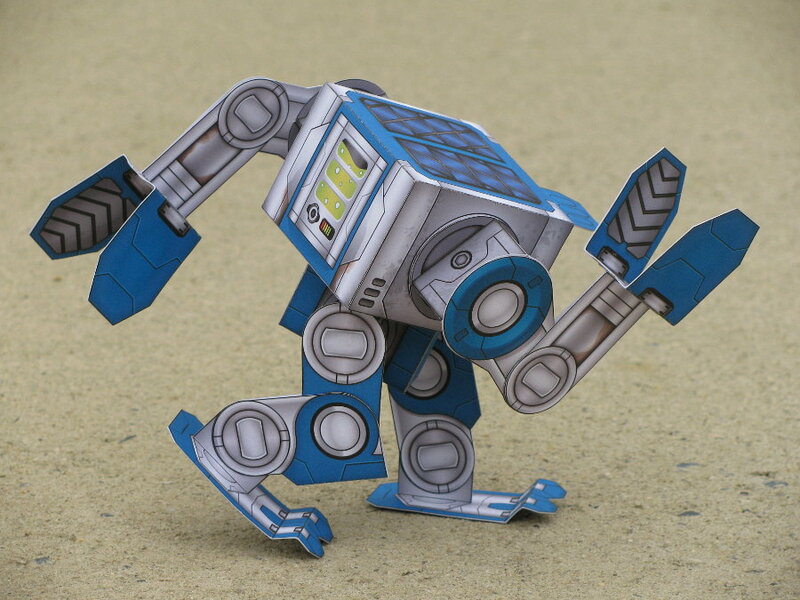 This Djeco kit and the other paper toys kits they've just released appeared on my radar without any warning. Searching for these kits reveals no previews in English. Paper model collectors will be happy to know there is another kit now available, Hip Hop Tanaka, featuring five toys designs by Shin Tanaka! 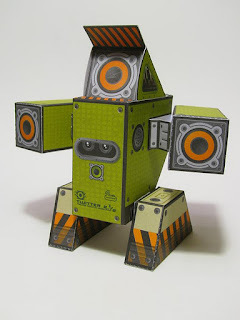 "Urban Robots" is a die-cut paper toy kit, in the style of Papertoy Monsters or the Paper Toys tin. 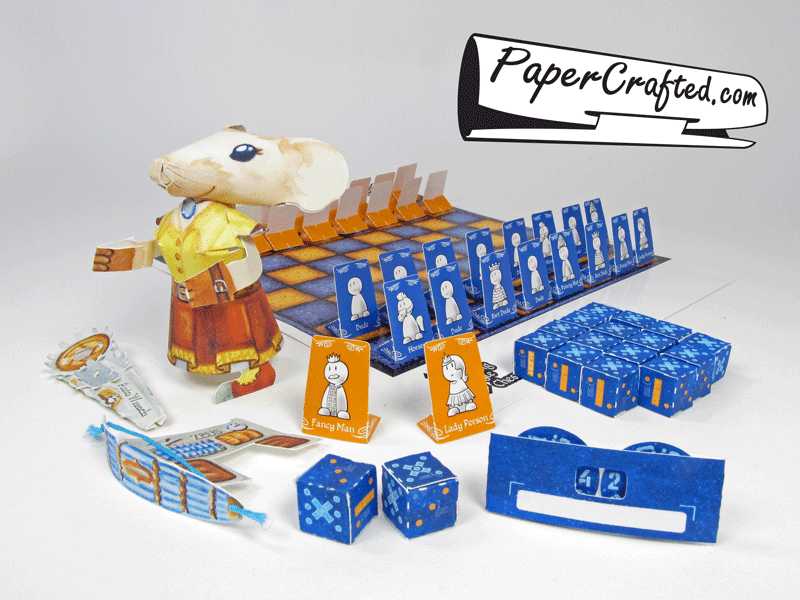 You'll just need a bottle of craft glue to get started! 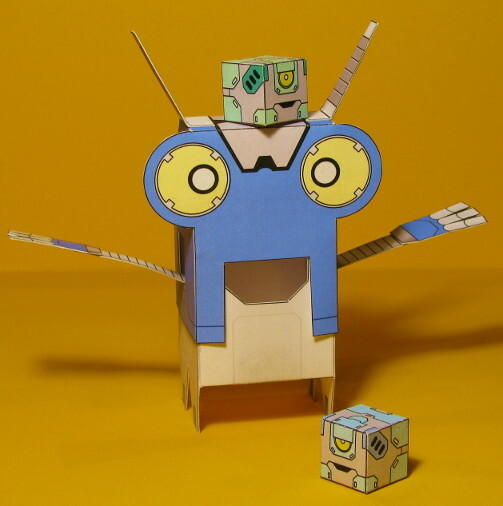 The robot designs are by Jean-René Ménard, an illustrator who designs plastic toys for Djeco as well. 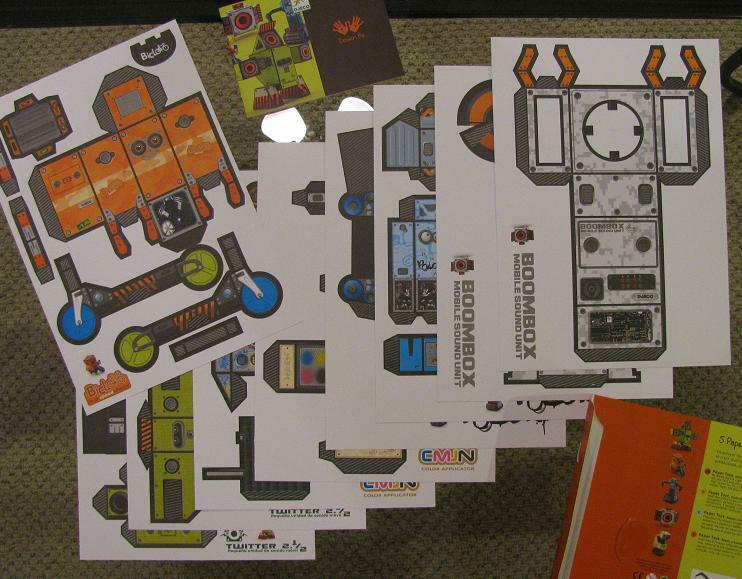 A small, illustrated instruction booklet is included with the sheets of parts. 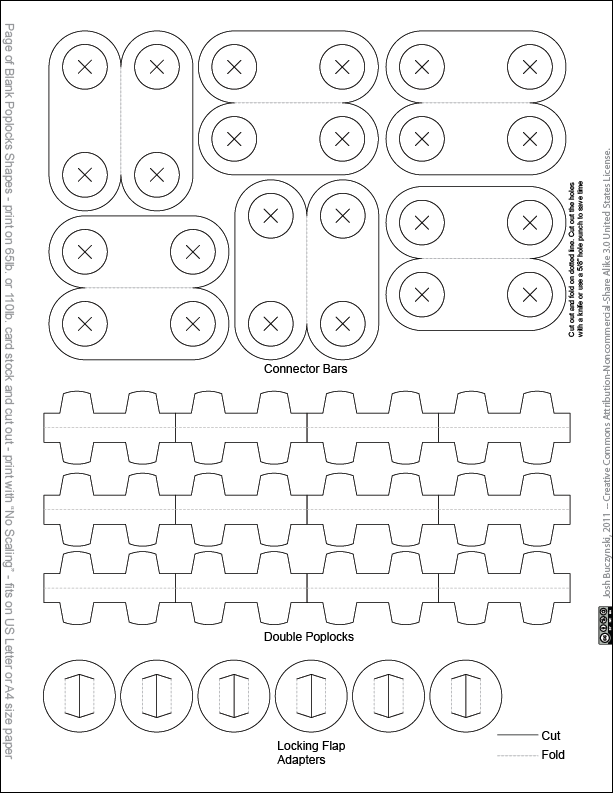 Four of the robots have two pages of parts and the other is a single page. All five of the robots have bright colors and a common design scheme full of details like hex nuts, ear mics and grills and vents -- design touches that I myself like to use on robot designs! 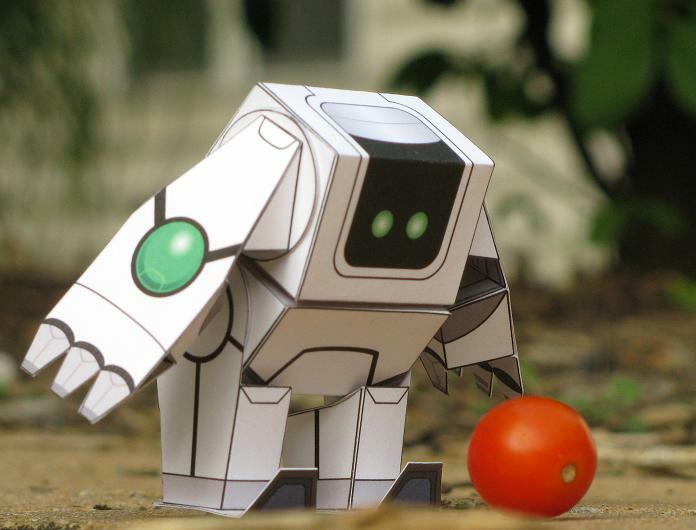 These are some of the best cute-styled robots out there. 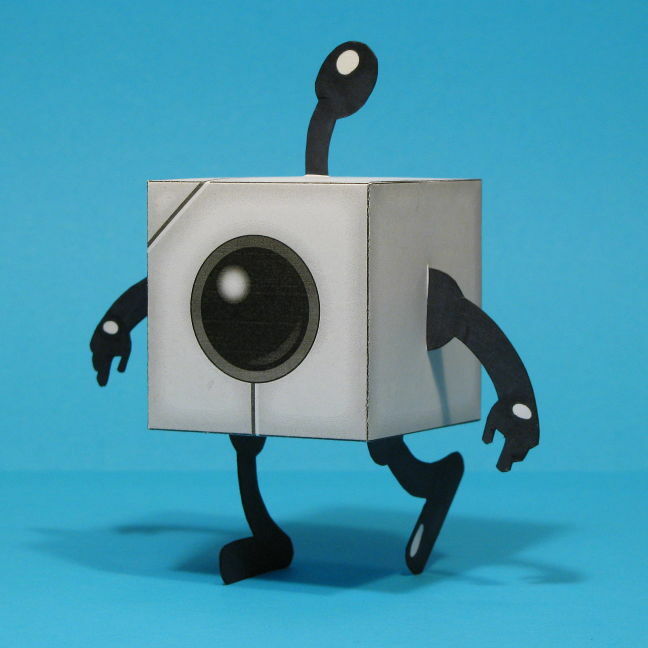 Each of the two-page robots, Boombox, Polok, Twitter and CMJN also have an element of pose-ability or movement. 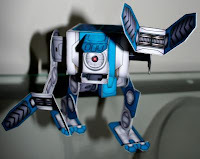 Boombox and Twitter both have hidden speakers that can pop out. 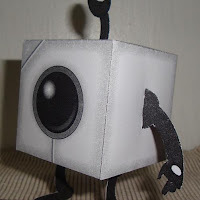 Polok has a sliding panel and CMJN has a paint nozzle head that rotates, slides up and down, and the head can tuck into place. 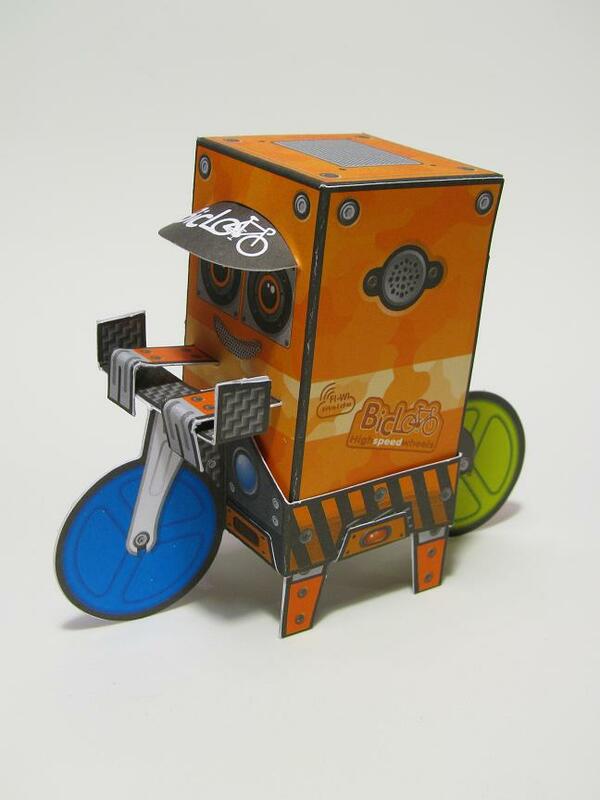 The single-page Biclo robot can be placed in and removed from his little bicycle - sweet! The quality of the materials in the kit are good; each page is die-cut with high precision and all parts are easily removed without tear or rip damage. 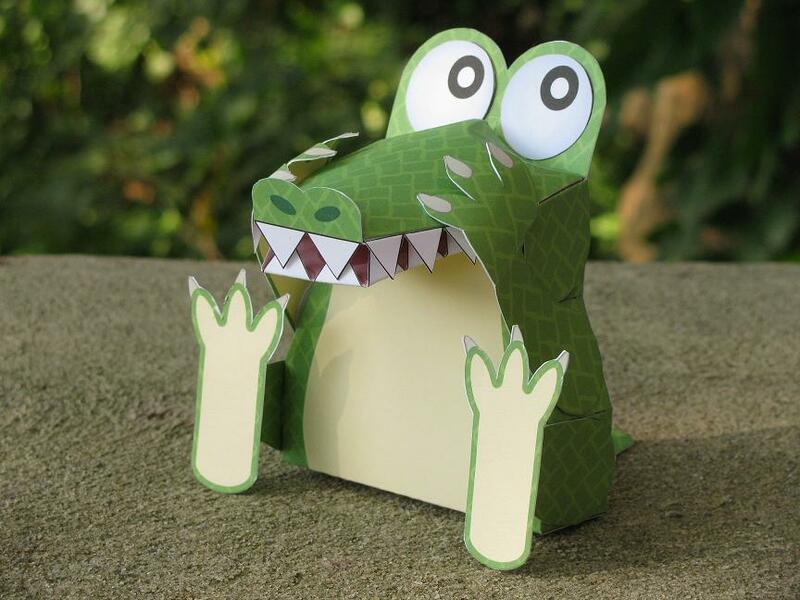 The sturdy card stock paper is thick enough to last a long time, but be careful when folding the edges back and forth - some delamination and peeling can occur if you aren't careful. 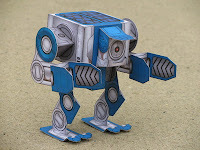 The complexity of each robot is easy and approachable for paper crafters of an experience level just beyond "beginner". No part is too slim or fiddly. 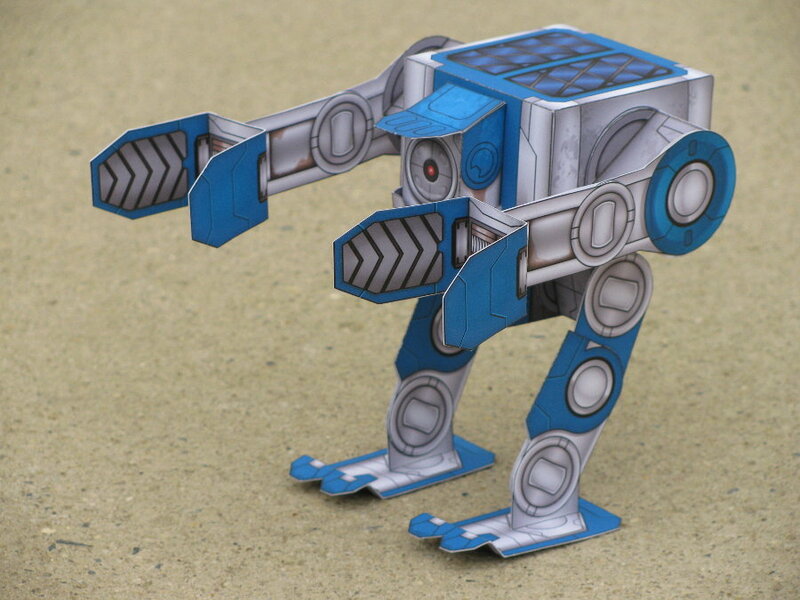 Each shape is robustly supported by glue tabs of appropriate size. 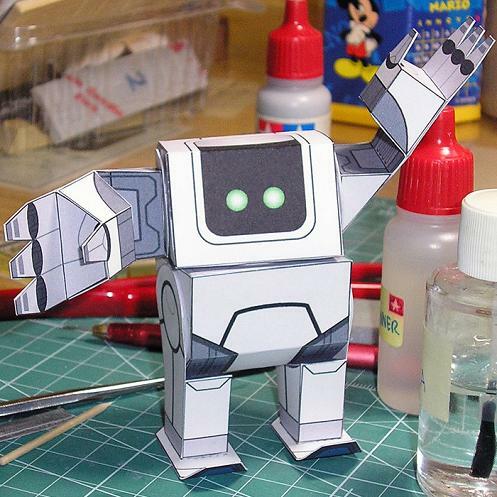 The instructions will guide smoothly through the construction of each robot. 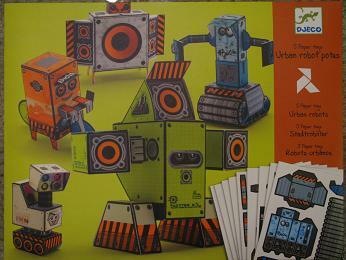 Urban Robots are fun to build and fun to play with! 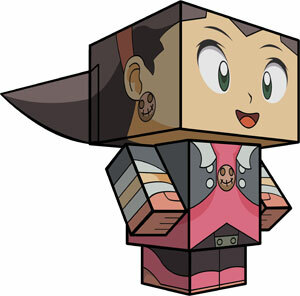 I'm looking forward to getting the other paper toy kits in the series, especially Hip Hop Tanaka, Spacecraft and Dragons and Chimera. 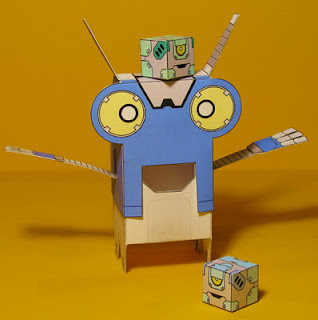 Search for these kits through Google, since they seem to have been distributed mainly through educational toy channels -- these paper kits aren't really books, so they don't all show up on Amazon or Barnes and Noble. 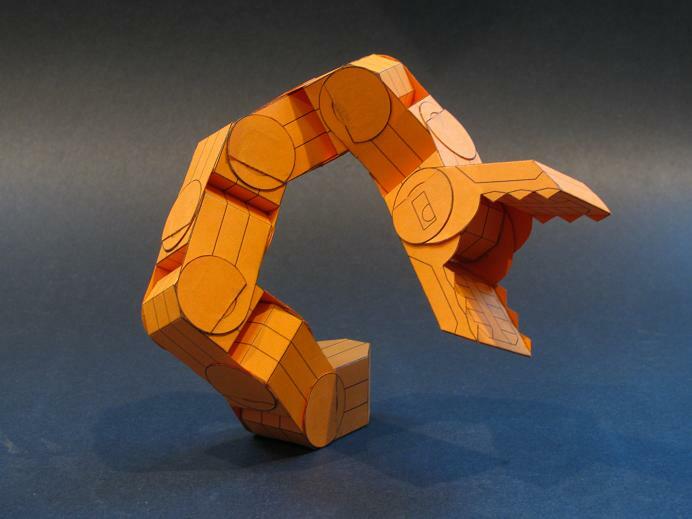 Beta Antoni has made his first stop-motion animation, and it happens to feature Facebot practicing his new dance algorithm. 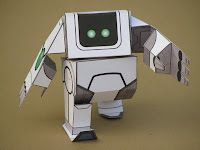 There are some very smooth moves here, and Beta's hard work has inspired me -- I need to make a robot design that is specially designed for being an actor in stop-motion movies just like this. Thanks Beta! This is great! 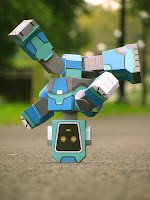 Cubeecraft has released the Tron Bonne Cubee, and I made it! Make this along with all of Chris Beaumont's other Megaman Cubees over at Cubeecraft.com! 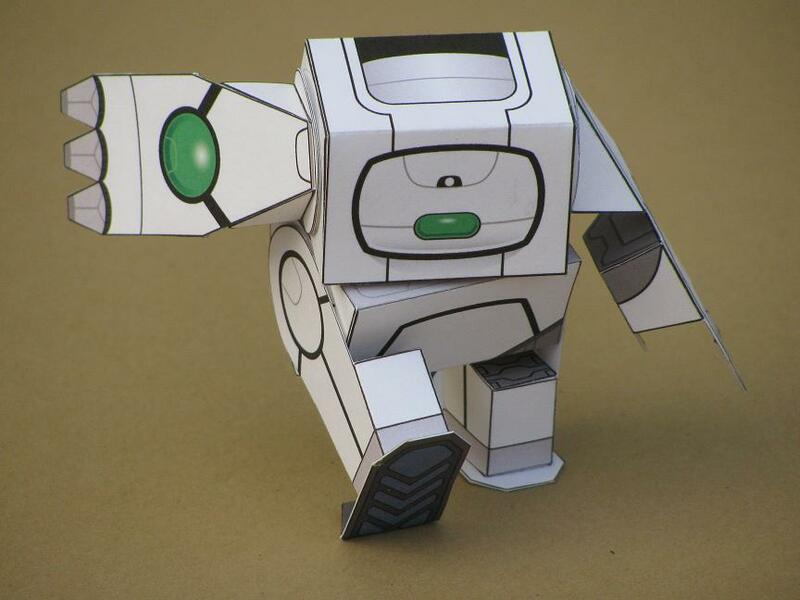 You'll need to make about 40 Serv-bots to release the ultimate power of this Bonne pirate! 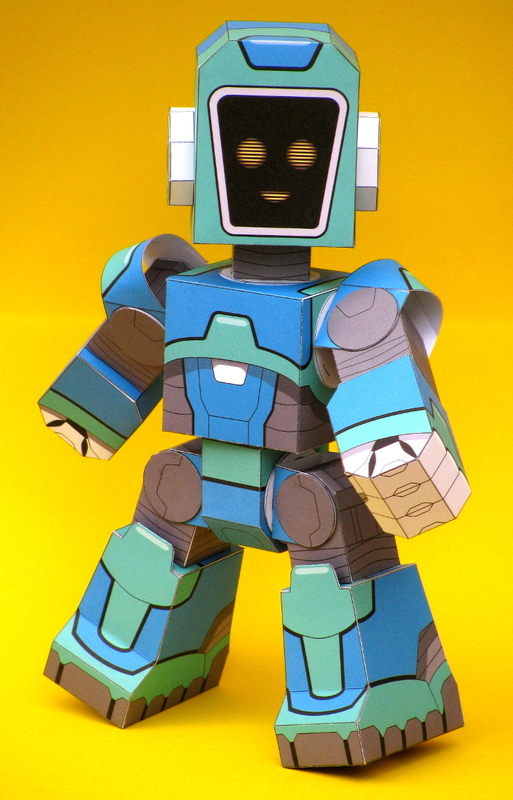 Okay, this is one big and awesome paper toy, and so it gets a matching awesome name. The Facebot VSN Dynactron MK IV is 5 pieces of paper PACKED with parts for you to score and cut out. The finished toy is 10 inches tall and has 10 axes of rotation! 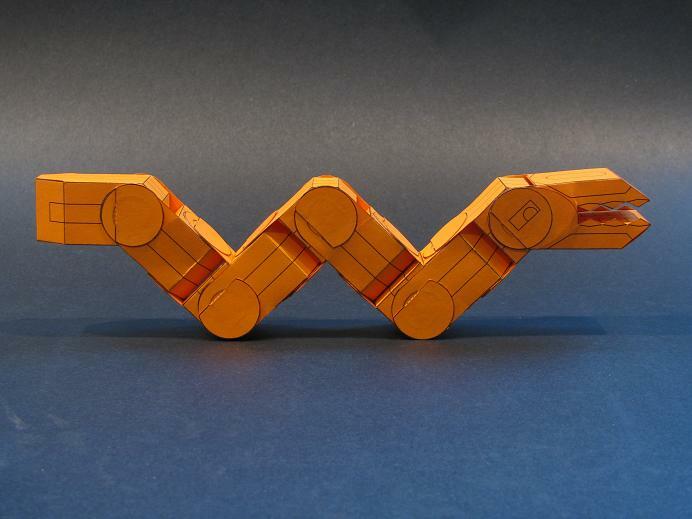 A slightly improved design for the flat axles is built in to each disk. You'll notice one large end of each disk has little "claws" sticking out. 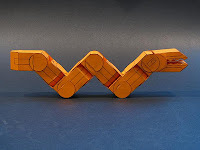 These enable you to more easily screw the disk into their holes. Be sure to use a little bit of tape to seal the back of each entry notch in the holes, after you've screwed in each disk. I've worked very hard to make this toy as easy to put together as I could... YEARS... really! Wait till you see what's coming up in the near future!